All should read this book, let the debate open as Nicole says. Intervention/ Stronger Futures legislation needs to be scrapped, and the calls to treaty/ies be heard. Alastair and Arnold strong also. Please take a little time to read media release (MR) below. Interview- with Alastair Nicholson, 23rd September, listen from 31min 36 sec at http://www.3cr.org.au/tuesday-breakfast on the book, excellent and also on Constitutional Recognition& Treaty-Time for aTreaty (from 44 sec- "we should be working towards a lasting treaty with Aboriginal people..."
Book information at end, "well done" to co-editors Rosie Scott and Anita Heiss and all contributors. Melbourne launch of New Book, “The Intervention – an Anthology”, is very Timely. In the second half of 2015 it is becoming clearer that many Aboriginal people and their communities “are now so fed up with Government orchestration of the so called policy consultation process that they are asserting their right to discuss the issues on their own and where necessary challenge or resist the oppression,” Jeff McMullen AO. This is leading to growing calls and meetings across the country for the right of Aboriginal people to determine their own futures and for recognition of their sovereignty through treaty or treaties. Nowhere is this more pronounced than in the Northern Territory where Aboriginal people have now lived under the Intervention for eight years with its consequent disempowerment of Aboriginal communities. In 2012 the Intervention was rebadged and extended for ten years (Stronger Futures and other related package of three laws). This imposed further punitive controls over Aboriginal peoples of the N.T. With this context the newly published book, “The Intervention – an Anthology”, is very timely. More than twenty award-winning and internationally recognised Aboriginal and non-Aboriginal Australian authors have taken a stand by using the power of their words to generate much needed discussion and debate. Importantly, as well, the Anthology includes statements from a number of N.T. Elders about the Intervention. Indeed, this book chronicles a very shameful page of our nation’s history. The book gives a broad-sweeping assessment from people who live under the destructive impacts of intervention controls, as well from writers and Aboriginal leaders who clearly see the damage the Intervention continues to do long after it has disappeared from the mainstream psyche. Contributor, Nicole Watson writes, “In spite of the profound consequences for Aboriginal people, the public debate over the measures has been minimal.” Nicole, of the Birri-Gubba people, will join one of Melbourne’s contributors, Arnold Zable, and well known Australian author in speaking at the Melbourne launch. ‘The experience of so called “consultation” by successive Federal Governments has led to a complete loss of confidence in such a process on the part of many Aboriginal and Torres Strait Islander people to the point that it is questionable whether any agreements based on consultation can ever be legitimate. 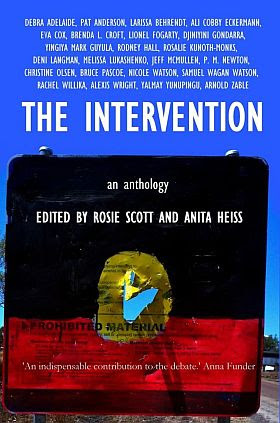 This book, The Intervention – an Anthology, adds to the litany of actions that have oppressed and continue to oppress Australia’s First Nations People for over the last 237 years. The book should be widely read by Australians young and old. It is time to “listen” to the people and allow their rightful place and voice in their lands. Contributors to the Anthology include: Debra Adelaide, Pat Anderson, Larissa Behrendt, Ali Cobby Eckermann, Eva Cox, Brenda L. Croft, Lionel Fogarty, Djiniyini Gondarra, Yingiya Mark Guyula, Rodney Hall, Rosalie Kunoth-Monks, Deni Langman, Melissa Lucashenko, Jeff McMullen, PM Newton, Christine Olsen, Bruce Pascoe, Nicole Watson, Samuel Wagan Watson, Rachel Willika, Alexis Wright, Yalmay Yunipingu and Arnold Zable. Media Contacts, were Alastair Nicholson, Arnold Zable, Jeff McMullen & Nicole Watson. In this historic anthology, award-winning writers Rosie Scott and Dr Anita Heiss have gathered together the work of twenty of Australian’s finest writers both Indigenous and non-Indigenous together with powerful statements from Northern Territory Elders to bring a new dimension and urgency to an issue that has remained largely outside the public radar.